The A-10 released it’s conference schedule this week, meaning schedules are set and most of the year’s regular season TV games are locked in. Looking through the schedules, here are my top TV matchups involving A-10 teams (who aren’t leaving for other conferences) this season. VCU campaigned for it, but Butler got it. ESPN’s College GameDay is headed to Hinkle for the conference’s first-ever GameDay hosting duties. Butler fans will be fired up, and they’ll have to be, as the the yelling starts early, and hopefully ends with a Butler/A-10 W.
The Rams kick off the Thanksgiving tournament with a battle agains the Memphis Tigers, follow that up against either Duke or Minnesota, and hopefully win their way to a marquee matchup against Louisville. A lot of ifs, but with such a stacked field, the Rams are guaranteed a slew of great games on national TV. This game is contingent on SLU and Kansas handling their business in their games prior. But the POSIBILITY of getting one of the A-10’s top teams against one of the nation’s top programs has me very excited. Texas A&M stands in the Billikens way, but after a sub-.500 season, SLU should be a solid favorite in that game. The Rams take on former head coach Anthony Grant after the Tide got back to the NCAA tournament for the first time since 2006. You don’t often see a BCS school play a roadie like that, but credit the brilliance of VCU’s coaching contracts for forcing yet another former coach back to the Siegel Center. The last time that happened VCU blitzed Jeff Capel’s Oklahoma squad by 13. Another speculative pick, but assuming the Minutemen can avoid a letdown against the Friars of Providence, a potential matchup against a very good NC State team might await. If that’s the case, you’ve gotta assume that one makes the deuce or U and instantly becomes a must watch game for A-10 fans. You think these two are looking for another shot at each other (hopefully not literally)? X will have a TON of new faces, but on the deuce and in a rivalry game, I gotta think they’ve got a punchers chance (oh the puns!). There are a ton of great games featuring top A-10 teams, but I single this one out because it kicks off the conference schedule for these schools. SLU might enter the season as the A-10 media’s top 10, but UMass won’t be far behind. A-10 opponents will want to take a peek at this one. I’d be surprised if any of us have the PAC-12 Network, but this is another one of those marquee matchups between one of our finest representing A-10 pride against one of the top teams from a BCS league. In an odd “non-conference” matchup (scheduled before the Bulldogs were headed to the A-10), two of the nation’s best non-BCS squads will get an early season glimpse of each other without the outcome effecting A-10 tournament seeding. Weird…but cool. Two reasons. 1) It closes out the season, and 2) It’s on CBS. 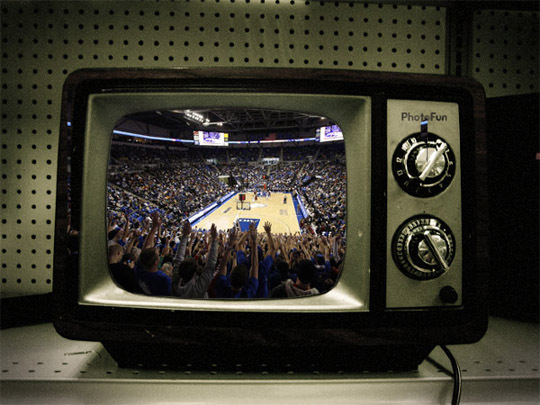 ESPN games are cool, national network TV is even cooler. Always odd to look at, the Bulldogs have been pretty successful when their bench is below floor level (see: two Final 4 wins since 2010). Anytime the conference can get a shot to pick up a road win against an SEC program on an ESPN channel it’s worth watching. Slight chance you have to live in Kansas to watch this one on the deuce as Kansas’ schedule shows it airing on ESPN2 while Richmond’s does not, but hey, good enough for me. Richmond will be looking to avenge a 20-point 2011 Sweet 16 loss while matching their 1-point road win against then No.14 Kansas Jayhawks in 2004. If it really is on, I’m watching. Once again, conference pride on the line on ESPN2/U against a BCS conference opponent. Don’t sleep on this game. The country was made aware of just how good Lehigh was when they knocked out Duke in the first round of last year’s tournament. The Mountain Hawks return key pieces from that squad in another good OOC game for the A-10. No idea what A10 TV is, but I like the sound of it. Minutemen kick off their season against a tough Harvard squad as a part of ESPN’s Tip-Off Marathon. Remember you’ll need to be “sick” for this one, as the 10AM Tuesday tip will be tough to watch at work. It’s Big 5 basketball on an ESPN network, not much wrong with that. Villanova struggled last season but with city bragging rights on the line this is a big one for the Hawks and A-10 fans against another BCS team. Miami just missed the NCAA tournament but return a solid team under Jim Laranaga. A-10 v. ACC = coastal bragging rights. Go Minutemen! Another under the radar matchup of tradition-rich teams in a bit of a reloading process. Dayton loses a ton but like their opponent, return their top scorer from last season. Flyers v. Racers…sounds fast-paced doesn’t it? A-10 would love a win here. Last season’s A-10 champ gets the honor of being the first team to host Shaka Smart’s squad in conference play. A lot of questions surround VCU’s ability to win these kinds of games in their newly strengthened conference, which is why I think this one is so intriguing. Great A-10 battle to see which A-10 team rebuilds faster. Also happens to be the conference opener for both teams.